This National Park Service spectrogram, from the Western Soundscape Archive, visually represents the sounds heard at a particular site over the course of 24 hours. Sound is fleeting. Unless it is recorded while it occurs, it can never be heard again. As the earth evolves, species come and go, ecosystems change or are destroyed, and urban landscapes transform; when organisms and ways of life go extinct, their sounds disappear with them. We record music, lectures, and performances, but it is relatively uncommon to record our everyday activities and environment. There are, however, a few efforts to do just that. High Country News recently published a profile of Jeff Rice, the founder of the Western Soundscape Archive. The archive hosts a growing collection of audio recordings of the flora and fauna of the Western United States. The collection also provides access to National Park Service acoustical monitoring. 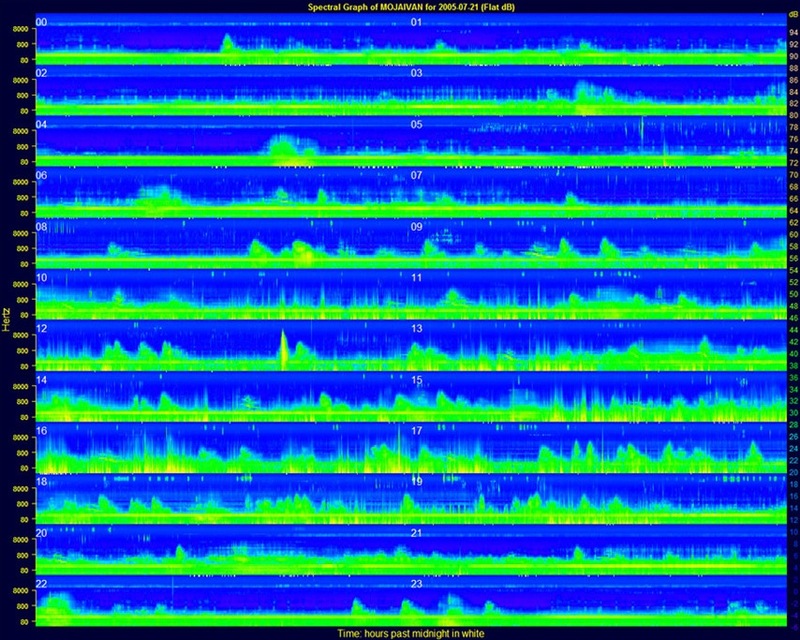 These take the form of spectrograms–images that show, over 24-hour periods, the relative prevalence of bird songs and airplanes, crickets and cars. They provide information about a region’s biodiversity as well as the impact of anthropogenic noise on its ecosystems. It develops from the insight that it is basically impossible to map the complexity of todays [sic] public spaces. Against the background of an increasing awareness of spatial aspects in media and the popularity and presence of visual geographies like google maps, the idea was to connect sound and space, and to create a cartography which focusses [sic] solely on sound, and open it to the public as a collaborative project. Meanwhile it contains 1000s of recordings from numerous urban, rural and natural environments, showing the sonic complexity of these environments, as well as the different perception and artistic perspectives related to sound, space and places. Furthermore, it’s an exciting playground for experiments with sound and mobile media. A sound archive could someday form a very engaging and informative part of a library dedicated to describing the human experience as it has evolved through time. Think of a museum exhibit on the ocean that includes short sound clips: rolling waves, the incessant squawking of seagulls, the call of an elephant seal. The portrayal instantly becomes more vivid, more real. For a future human to grasp what it meant to live in the 21st century, it could be quite useful to have a soundtrack with examples of car traffic, a busy farmer’s market, or perhaps even the soft chirping and buzzing heard in a pine forest on a sunny morning, out of earshot from human civilization. Click here to hear the Western Soundscape Archive’s recording of a bark beetle (one species of which is responsible for the current epidemic that has killed vast swaths of trees in the Rockies). Long Now’s Alexander Rose recently visited the Svalbard Seed Vault with Steve Rowell, who uploaded to Aporee this recording of a Svalbardian windstorm. Make sure you’ve got a warm blanket with you. How good are our predictions of the next 30 years?